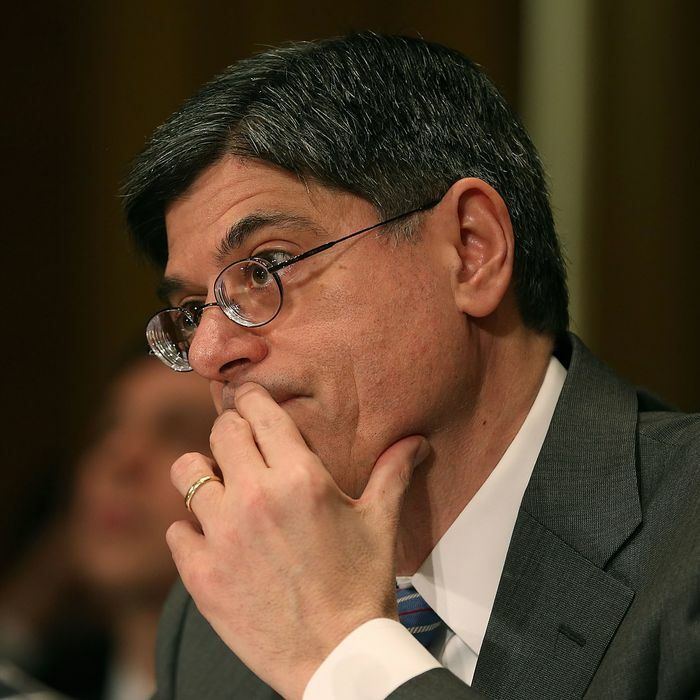 It’s no secret that Jack Lew is not a terribly exciting man. He is constitutionally wonky, deeply religious, and famously averse to drama. When budget expert Alice Rivlin was asked to provide a funny anecdote about Lew, she reportedly said, “Jack isn’t a funny anecdote guy.” Perhaps the most interesting thing about him is his crazy signature. As a private citizen, these traits are liabilities. But as a budget wonk being grilled by the Senate Finance Committee about your nomination as President Obama’s second-term Treasury secretary, it’s exactly what you want. Lew aced his first confirmation hearing today, parrying a lot of boring, uninformed questions about corporate taxes and financial regulations with a bunch of equally boring and substantially more informed answers. The Lew grilling was orders of magnitude better than the uninspiring mess that was Chuck Hagel’s confirmation hearing, and it maintained a level of friendly collegiality throughout. There were no vocal protesters — only a group of activists silently sitting behind Lew in Robin Hood hats in support of a financial transaction tax. As Obama’s longtime chief of staff, Lew is an administration man. His fiscal policy ideas are down-the-line replicas of Obama’s own. He refused to back a reinstatement of Glass-Steagall, calling it “something of an anachronism.” He spoke about the Obama administration’s attempts to spare smaller banks from some of the most burdensome regulation imposed on large banks after the crisis, while making it clear that he sees some danger in meddling with the forces of the free market. “We don’t intervene in markets on a regular basis,” Lew said, in response to a question about the comparative borrowing rates of large and small banks. In all, Lew did what he needed to do today. He proved he was not a creature of Wall Street, despite having worked there. He was wonky without being condescending, congenial without acquiescing, and left no doubt of his technical qualifications. There is no reason to suspect he won’t sail through the confirmation process. Still, those who weren’t fans of the reign of Tim Geithner may not like Lew, either. Like Geithner, he doesn’t demagogue against the financial sector, and he seems to consider overall market health — rather than punitive measures against irresponsible institutions — a paramount priority. His ideas all seem to carry the Establishment’s imprimatur. Which isn’t a bad thing, unless you wanted a different establishment.